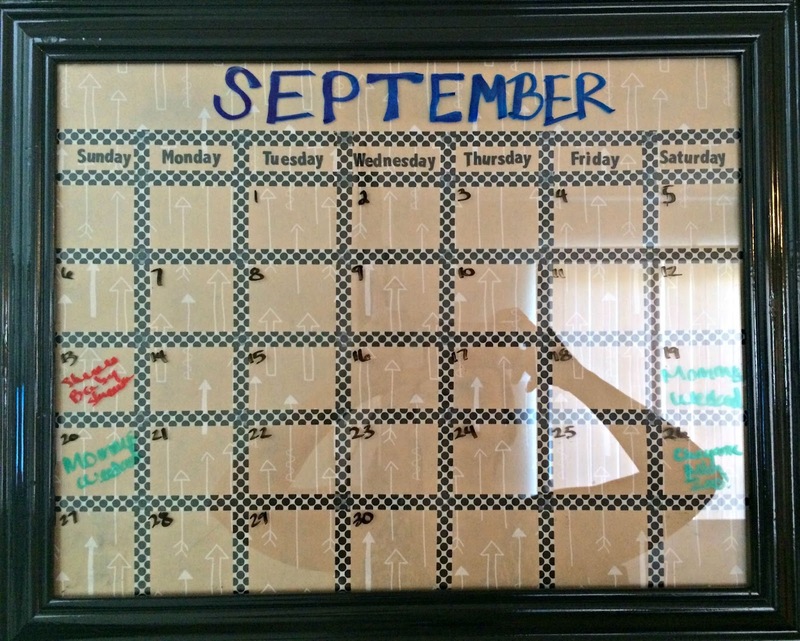 School has started, schedules are crazy and space is limited. 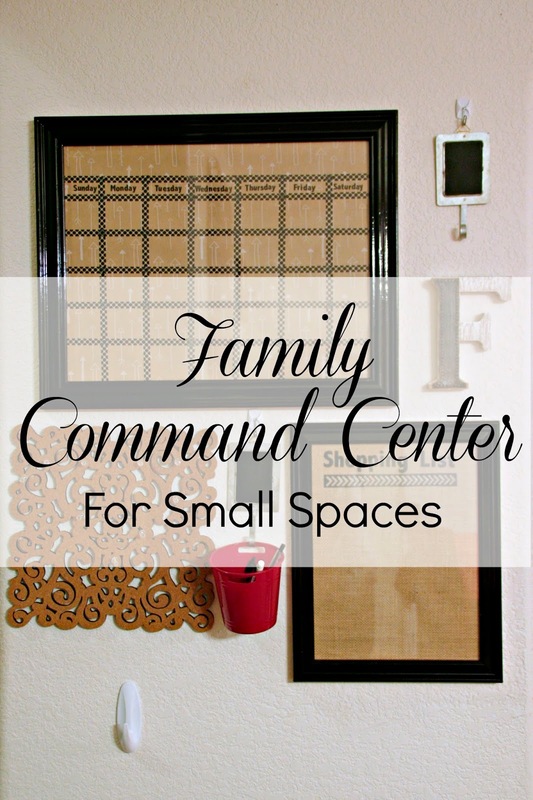 I have been loving all of the family command centers that I see on Pinterest, but most of them are for much larger spaces than what we have. With some clearance and thrift store finds, I was able to create a family command center that fits our small space! The space that I had available was only about 2 foot wide and I knew that I wanted a calendar, place to post invites and notes and a shopping list. I also wanted to keep this budget friendly as honestly some of these command centers I have seen, I started to price out and they are upwards of $200.00! Yeah, I don’t think so. I scouted the thrift stores and snagged two picture frames that I knew I could paint. I also hit up my local Michaels and looked through the clearance and dollar sections and got some great finds. This 12 x 16 picture frame was a $2.00 thrift store find. I spray painted the frame glossy black and then used some arrow wrapping paper I found in the dollar bin at Michaels as the background to my calendar. To make the lines, I used washi tape. A box of expo markers is what I use to write the month and dates and events. I used my silhouette to cut out the days of the week and made them into stickers using a sticker making machine. I spent a total of $10.00 on this little craft project. 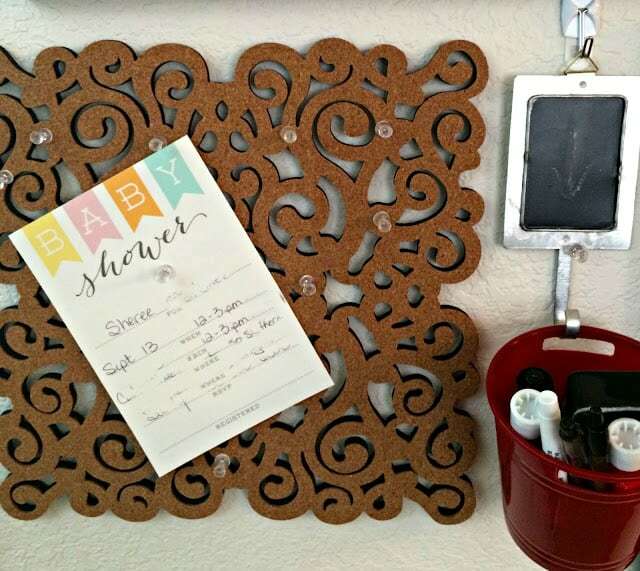 Michaels had this adorable swirly cork board square on sale for $7.00 and the metal chalk board hooks were only $1.00 each on the sale. I also snagged a 3 pack of these little red buckets for $1.00. I had some push pins at home. Everything is hung with 3M Command Strips and hooks. 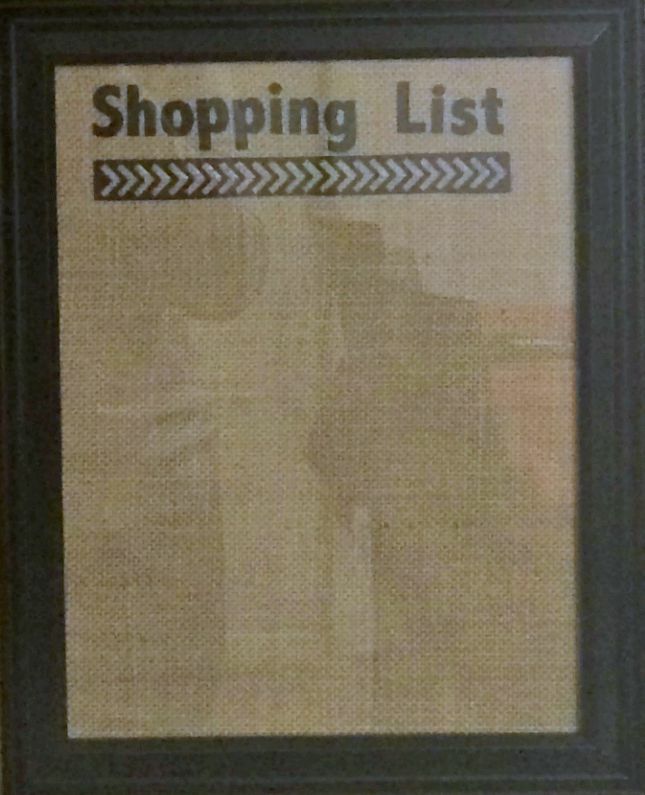 I also picked up this picture frame for $1.00 at the thrift store. I had some burlap that I used as the background and then used my silhouette to cut out the words and arrows and made them into stickers using a sticker machine. We write on this with expo markers too. Seems like every family command center has their monogram in it, so it was only natural that I included ours. For $1.00 it was hard to pass up anyway. Also do you even know how difficult it is to find a “F”? Seriously I scoured Michaels and finally snagged this little guy. I also put one of the chalk board hooks to hang our mail key on. I am very happy with our little family command center. The hubby likes it too and uses it all the time! If you have a small space and want to do something like this, I highly encourage it. Make it work for your family and start scouring those thrift stores and craft stores for items that fit your budget and style.